10 quick-hitting actions (audibles) with multiple reads, players have freedom to drive and make plays with the spacing they need. One-word commands are simple and strong. The first big runs to the paint (here it's 5), the wings run wide to the corners, the second big is a slow trailer, he assesses what they are doing. - against a trap or hard show, 2 passes to 4 popping, for a shot. See Fast breaks - Florida 2006. For an outstanding driver who doesn't need a screen, he can break down his man, put him on his best side (here 2 is left-handed), surround him with shooters. 1 passes to 2, cuts off 5 to the ballside corner, 4 and 3 interchange, 3 gets to the line of 45. 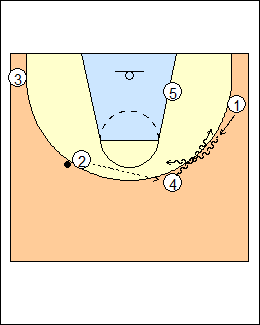 2 lets 1 clear out, the middle opens up, with two shooters spread weakside, often 4 will get a wide-open shot as X4 helps in the paint. 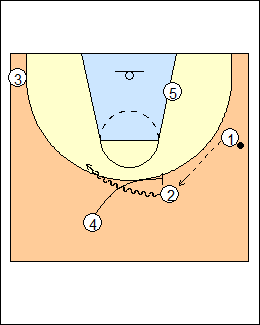 If 2 throws back to 1 in the corner, look inside right away to 5 isolated in the low post. 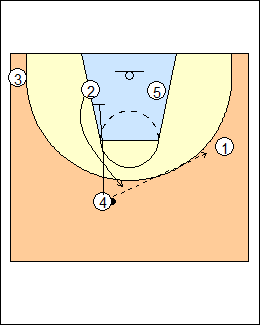 See Offence - Walberg dribble-drive attack (Kickups), Calipari dribble-drive (post-ups). 2 and 4 are denied, 1 makes a dribble handoff to 2, 4 comes in for a top pick and pop (5 stays low) or pick and roll (5 replaces, shown). 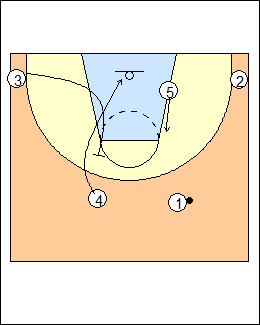 2 can pass back to 5 into a high-low, see Shallow below. 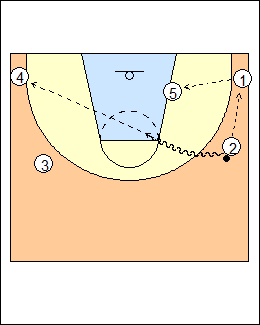 1 can make a read if X1 jumps high, skip the exchange, keep the ball, look to get it into the post. 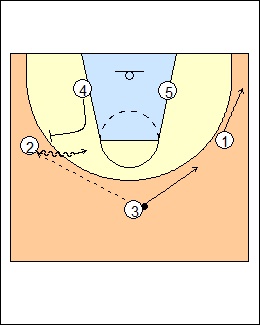 See Fast breaks - 5star pro-style (wedge), Nets (pistol down), Quick hitter - Trail. Use a shallow cut to get the ball to the wing when 2 is denied, it's like a shallow zipper cut, 2 clears the wing and comes up top, 1 can bust it up the side. The first option is an early post entry, 5 cracks in to get a piece of the paint. 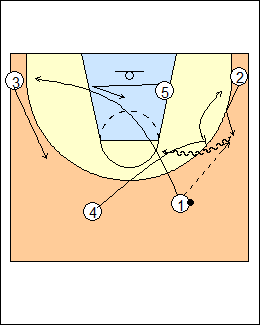 On a pass to 2, 4 picks and pops (shown), or rolls and 5 replaces, see Exchange above. On a pass to 4, look for a high-low pass to 5, if that's not there, dribble handoff to 1, pop, or roll and 5 replaces (see Up below). 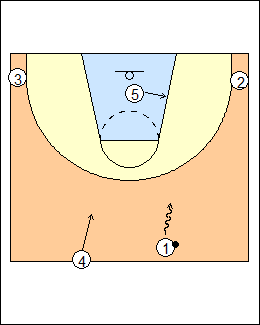 See Offence - Bill Self high/low motion (dribble over), Horns zipper fist. 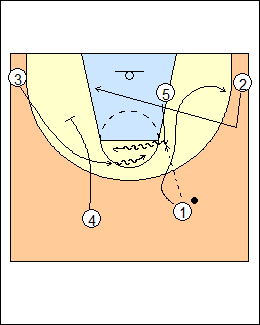 2 is denied, 1 hits the trailer off the elbow at the top of the key, it's right into flex action, 5 sets a flex screen, the first look is 2, 5 cracks in, 4 can take one dribble and pass to 5. 1 moves to the wing, creating space, if 4 passes to 1 he downscreens for 2, isolating 5 in the low post. See Offences - Tennessee playbook (play call #4), Flex specials (hold). 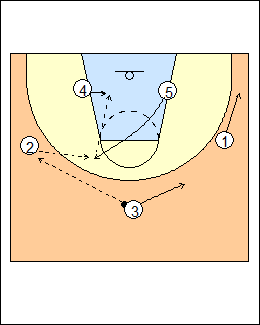 If 4 reverses the ball to 3, 2 posts then cross-screens for 5 (little-big) if he doesn't have anything, then 4 screens for 2 (screen the screener). See Offences - Flex specials (Xavier, cross), Nets (cross option, also cross-fist, cross-get), Fast breaks - Memphis (Flex cut), Serbia U18. 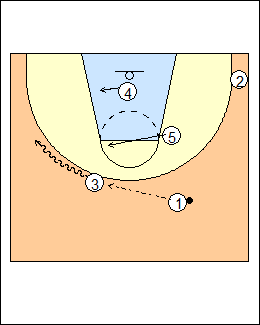 2 and 4 are denied, 5 flashes to the ballside elbow for a pass, 2 comes out and sets up a backdoor cut, 1 sets up a cut for a handback then goes to the corner if it's not there, 4 downscreens for 3 right into a dribble handoff. 5 rolls, 3 looks to attack the basket for a shot or kick-out to 1, 4 gets 2 for a two-man game on a throw-back from 3 (2 shoots or passes into 4). See Offence - Seth Greenberg slice, Horns 45 backdoor. 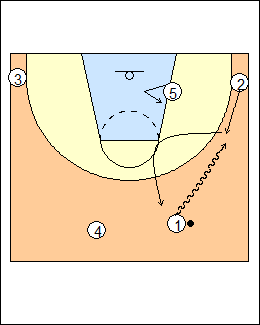 They're getting stagnant, try to get some movement, crossing action, different guys handling the ball. 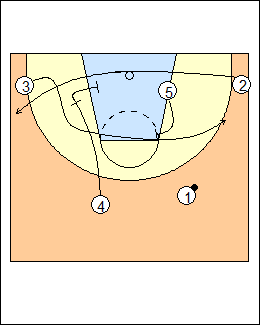 1 passes to 2 and cuts to the basket, 4 screens down for 3, who comes up to the top of the key. 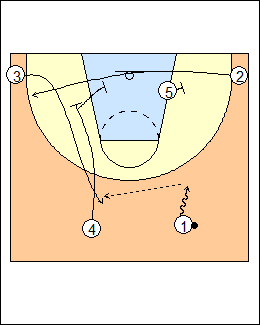 2 passes to 3 and cuts into the lane for single-double action, 4 and 5 are screeners at the blocks, 1 and 2 can cross and come out. Get into high-low on a pass to a wing. 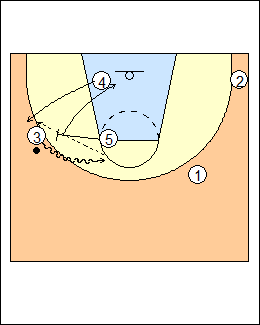 Or get into a quick Wide, 4 circles up to ballscreen. 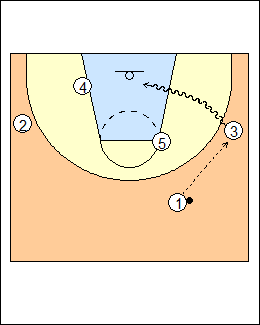 See Fast breaks - Tom Crean (Thru screen), Offences - Power, High-low. A favourite with a shooter like JJ Redick. 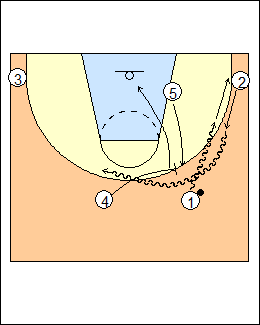 1 dribbles towards shooter 2, 4 downscreens for 3, setting up a two-guard front, 2 has a baseline double-screen, or can come back out to the same side off 5 (1 keeps his dribble alive and brings it back, or 3 throws back to 1). If 1 can't pass to 3 he shallows him out (tell him to shallow, bring it over, 3 shallow cuts). A pass to 2 would set up a high-low (5 comes high), on a pass to 3, 2 runs the baseline again. See Fast breaks - Florida 2006, Serbia U20, Xavier (staggers). 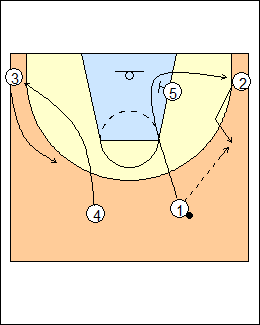 4 downscreens for 3, who curls into the lane (the first option) then uses a flarescreen from 5, while 4 screens for 2. 1 keeps his dribble alive. On a pass to 3, he can rip through and drive baseline (shown), the low post is empty, if he doesn't have that, 5 will ballscreen. 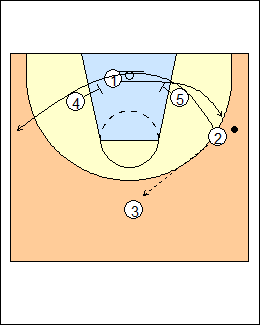 On a pass to 2, get into a quick high-low. 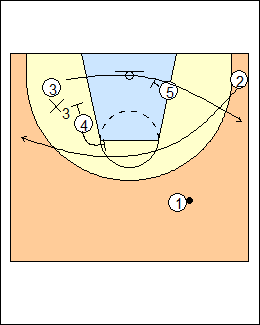 If X3 jumps on top to take away the downscreen, 3 goes low using 5 (don't fight the coverage), 2 comes high over 4. 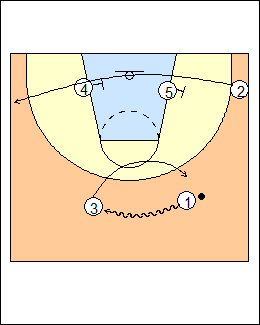 See Fast breaks - Florida 2005, Larry Brown (drag special), Offences - Leitao motion, European (options 10-11), Florida pick and roll (disguise), also Larry Brown 1-4. 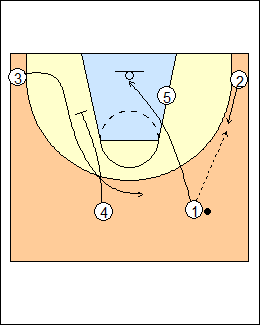 4 is an athletic big, 3 upscreens, 5 flashes to the ball to occupy his defender, the first look is a lob pass. 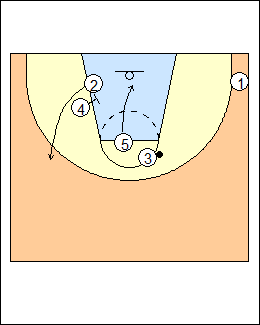 On a pass to 3, look for a shot or take it to the side, isolate 4 in the low post, 5 comes over into high-low. 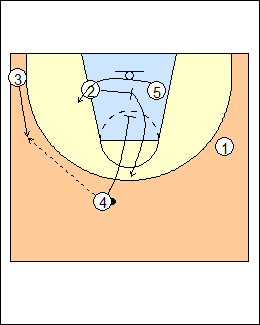 If none of that is open, 5 runs into a pick and roll, 4 replaces, 3 can throw back to 4 for a shot or pass into the low post. See Quick hitters - Lob options, Fast breaks - Atkins 2-out, Basketball Highway.